Google offers many services and products, mostly free of charge, to web surfers all around the world via Internet. The most popular and most famous is definitely Gmail. Other services include Alerts, Blogger, Calendar, Docs, Groups, Orkut, Talk, YouTube, Web History, iGoogle, Checkout, Analytics, AdSense and AdWords. If you no longer want to use any or all of the Google services, you can delete and remove and delete any number of Google services from your Google Account. Or if you wish, user can delete and close Google Account completely, together with all services and information that associated with the Google Account. Sign in and login to Google Account at https://www.google.com/accounts/. Click on Edit link beside My products heading. You will see two sections – Delete a Service and Close Account. 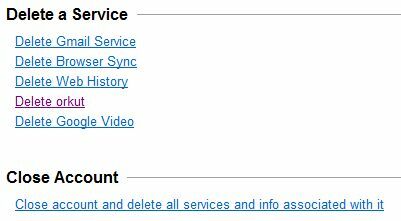 To delete and remove a service from Google Account, pick an appropriate Delete <service name> link. To terminate and delete Google Account and all services at one go completely, click on Close account and delete all services and info associated with it link. When choose to delete a service, a “Please read this carefully” warning message will be shown. Click to tick the check box for Yes, I want to permanently remove <server name> from my Google account or Yes, I want to permanently delete <email address> and remove from my Google account when asked whether Are you sure you want to delete <service name> (or <email address >)? If you choose to delete Gmail service, user is required to provide a new email address which will be used to sign into Google Account. It’s recommended that if you delete Gmail, it’s better to close Google Account altogether. When choose to close and terminate Google Account, click to check each and every check boxes for all services currently associated with the Google Account, and also Yes, I want to delete my account and Yes, I acknowledge that I am still responsible for any charges incurred due to any pending financial transactions options. Enter current password in the text box provided. Click on Remove <Service Name> button or Delete Google Account button to perform the deletion. Once the confirmation page is displayed, the selected service is removed from Google Account, or the Google Account has been terminated and deleted.